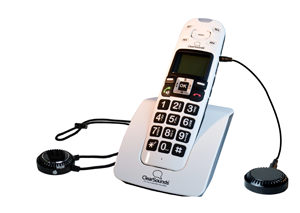 The QConnect by ClearSounds is a Bluetooth audio transceiver (transmitter/receiver) that uses Bluetooth to provide two-way communication between a corded or cordless phone and Bluetooth receiving devices. Compatible with any Blutooth headset or neckloop. For optimal results, we recommend the ClearSounds Quattro 4.0 Adaptive Bluetooth System.